Hello! As you guys know, I typically stray towards dark and neutral colors when getting dressed. However, earlier this week I decided to take a color risk and paired a lilac dress with a vibrant pair of orange wedge sandals. And surprisingly, I loved it! 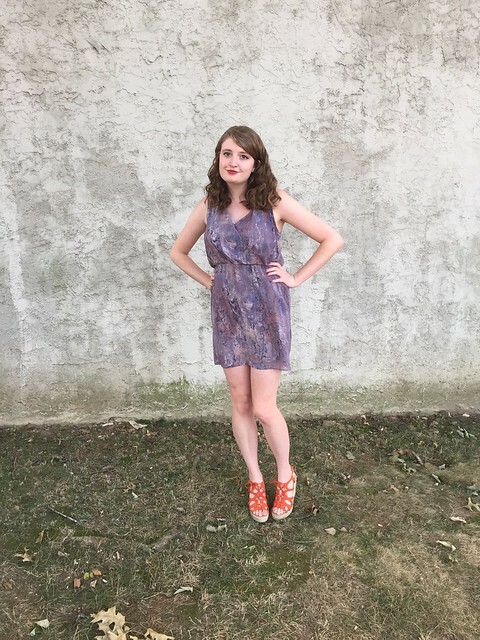 The various shades of purple in the marble print dress provide an aesthetically pleasing contrast with the bright orange wedges that really makes the colors of both pieces pop; the clash of the two colors actually works in their favor. This is one color risk that I'm glad I tried out! Hmm, now what else will I pair with these wedges? Although these are brighter than most of (all of?) my shoes, I'm glad that I added them to my wardrobe this fall. I snatched them up at Charlotte Russe a couple weeks ago for the ultimate steal of only $5! Although the bright orange color may scream "summer", I think it'll be fun pairing them with my fall looks to add a pinch of color.